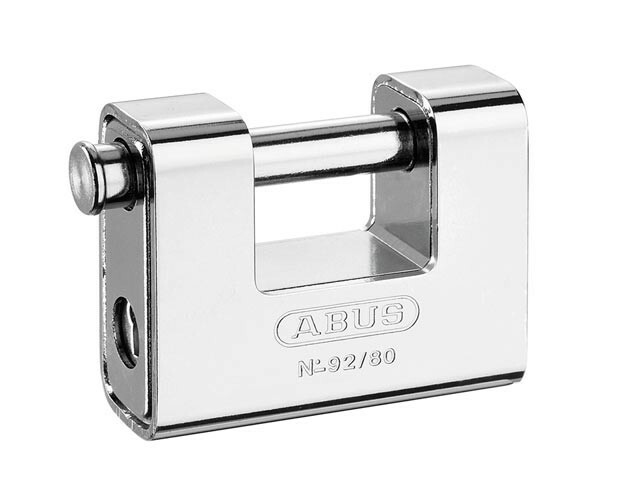 The ABUS 92 Series Monoblock Shutter Padlocks have a solid brass body encased in hardened steel jacket. Its shackle is made from hardened steel alloy, which rotates when attacked. The 5 pin precision tumbler cylinder features anti-pick mushroom pins and rust-free components. A hardened steel pin protects the narrow side of the lock against sawing and the deadlock mechanism requires a key to lock. It also features automatic locking, meaning the padlock can be locked without the use of a key by pushing the shackle. Ideal for securing valuables/goods of greater value or at a high risk of theft.